Some of you may know that Arthur C. Clarke is my favorite science fiction author. It may seem strange that it's taken me this long to read Rendezvous with Rama, but it happened that over the years I had collected two of the other Rama books but never the first so hadn't begun the series. When I happened across it in a used book store the other day, I snatched it up. The premise of the novel is this: a 50-kilometer long cylindrical space ship enters our solar system, giving the first proof humanity has that they are not alone in the Universe. A ship, The Endeavour, is scrambled to rendezvous with it and, if possible, enter the ship. Time, however, is limited, because as it approaches the Sun and perihelion, no one knows if it will change course and establish itself in orbit around the Sun or slingshot around it, sending it back into interstellar space. Many of Clarke's most famous works deal with first contact: 2001: A Space Odyssey, Childhood's End, and this novel. Like the monolith in 2001, no one knows if the ship Rama is under direct control of those who created it or if it is now acting on its own, completing a program that was set in motion eons ago, the writers of that program having long since died out. 2001 answers this question, if not for humanity at large, then at least for Dave Bowman as he is transported through the stargate. In Rendezvous with Rama, the question is never answered. Even after the crew of The Endeavour enter Rama and watch it begin to "come alive," they are left not knowing if the Ramans themselves are still present, or even if they can and will be recreated by the ship, as they assume the biological machines that begin to appear have been created from base elements present in a body of water that rings the center of the ship. In the introduction to Rama II, which I have already begun reading, Clarke mentions that he didn't originally plan a sequel. The purpose of Rama and what it meant for humanity was meant to be left open; it was meant for each reader to decide for him- or herself. I know that a lot of readers are unhappy when a book ends without closure but I personally love it. Perhaps as a writer I am more likely to continue the story in my own mind than non-writers. And I think that the highest purpose of art is not to answer questions but to ask them. 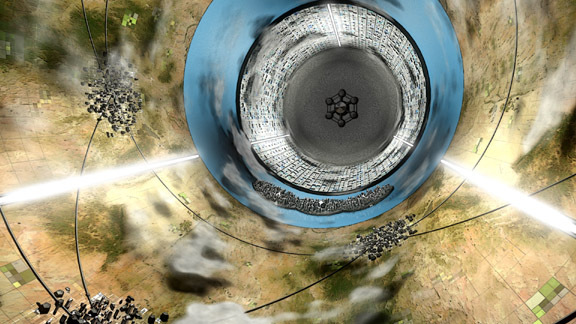 Rendezvous with Rama is highly satisfying both artistically and as a work of entertainment. There is, after all, a reason it won both the Hugo and Nebula awards, the two most prestigious awards in science fiction. As I read Rama II and the rest of the series, I will be anxious to find out if the way I answered the questions asked in Rendezvous with Rama is the same way Clarke and his co-author, Gentry Lee have chosen to answer them if, indeed, they answer them at all. But knowing Clarke, I feel that he will continue to surprise me and leave me, as always, asking questions. 5/5 stars and enthusiastically recommended! Update: See my review of the rest of the Rama series here.